Christopher Froome proudly raises the winner’s trophy of this year’s Tour de France up into the Parisian sky. The ornate crystal glass sculptures were designed by ŠKODA Design and made in the Czech Republic. 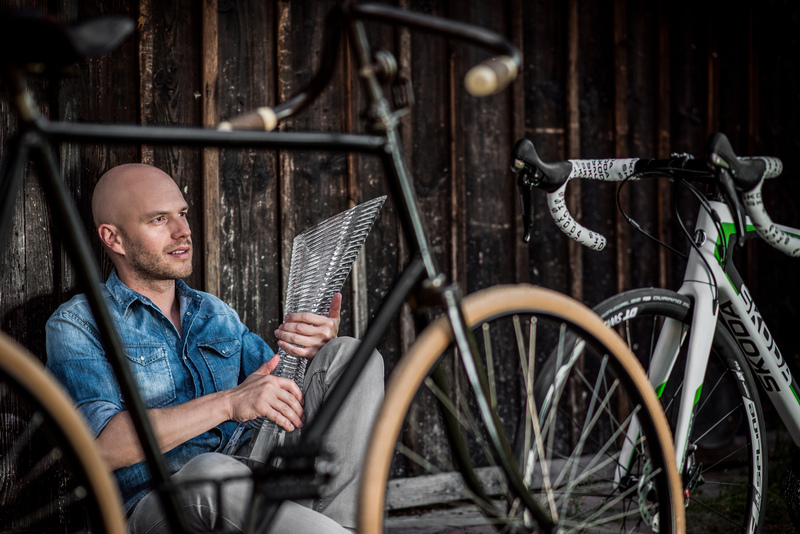 We spoke with designer Peter Olah about glass art, playing with fire and his love of the bicycle. Paris, Champs-Élysées. Christopher Froome has done it. More than 3,500 kilometres in the saddle are behind him, one of the greatest moments of his career stands before him. The professional cyclist proudly raises the coveted Tour de France winner’s trophy up into the sky. As the official main sponsor and vehicle partner of arguably the toughest cycling race in the world, ŠKODA has provided the ornate crystal glass sculptures for the winners. As a member of Jozef Kabaň’s design team, Peter Olah designed the trophies, which Bohemian glass artists then made by hand. We spoke with the 38-year-old about glass art, playing with fire and his love of the bicycle. Mr Olah, are you both a cyclist and a cycling fan? Peter Olah: I cycled a lot in my youth – mainly on mountain bikes: cross country, downhill, the whole lot. I often pushed myself to the limit. But I had a nasty fall when I was 20 which marked a turning point for me. I told myself, ‘You’re not good enough to be a professional cyclist anyway. So go easy before you end up killing yourself.’ Since then I have just cycled for fun. I’ve followed the Tour de France for a long time and needless to say, particularly closely since ŠKODA became the race’s main sponsor and vehicle partner. How do you design the sculptures? In the beginning, we did spend a lot of time thinking about how the trophies should look and had many nice discussions with ŠKODA’s Head of Design, Jozef Kabaň. 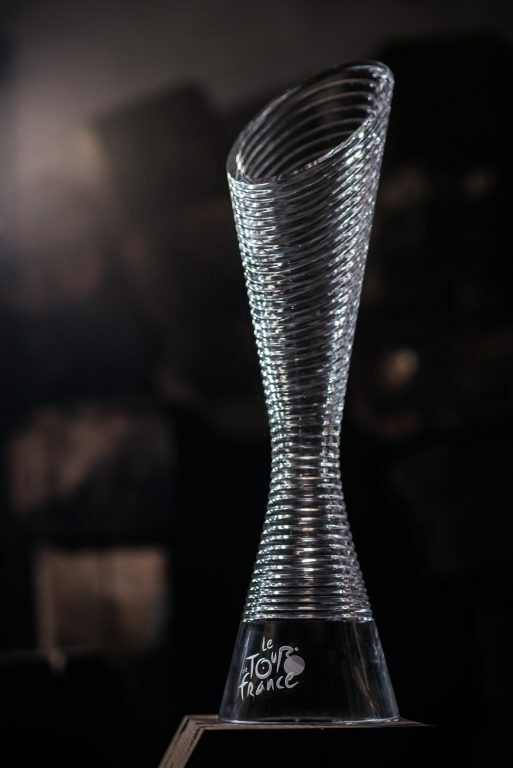 With the crystal glass trophies, we want to bring a particularly fascinating part of the Czech Republic to France and show the country and its people in the best possible way. This craftsmanship has a very long tradition in ŠKODA’s homeland. 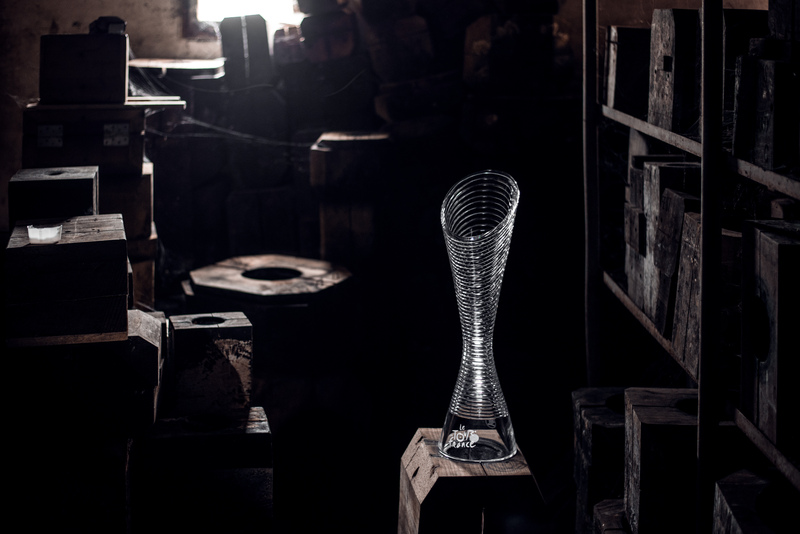 With the precise, sharp and clear lines of the crystal glass sculptures, we are consciously capturing the essence of ŠKODA’s current design language. The upright shape of the trophies is also important, so that the cyclists can easily raise them up into the sky during the presentation ceremony. Glorious quartet: As well as the overall winner of the Tour de France, the best young rider, the most successful climber, and the strongest sprinter also receive one of the coveted trophies. With the precise, sharp and clear lines of the crystal glass sculptures, we are consciously capturing the essence of ŠKODA’s current design language. The idea came to me in the ŠKODA Museum in Mladá Boleslav when I was standing in front of one of Laurin & Klement’s first bicycles from 1899. I admired its many exquisite features – very inspirational! 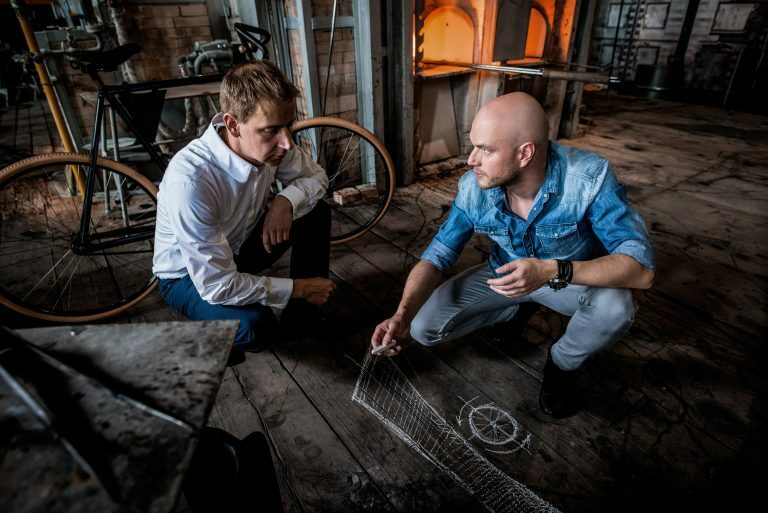 Experts at work: Together with Lasvit Vice President Aleš Stýblo, designer Peter Olah (right) sketches the embellishment that the experts will apply to the crystal glass as a finishing touch. What does the design symbolise? We are lucky enough to have complete freedom with the design of the sculptures. The Tour de France organisers don’t set any requirements, meaning that our creativity is given free rein. As well as that, we attach great importance to the trophies looking different every year and to each winner receiving an exclusive unique piece. Peter Sagan, for example, who won the green jersey five times in a row between 2012 and 2016, already has five sculptures at home – and they are all different. What changes is the embellishment on the glass and the technique used. The shape basically remains the same: the wide base is symbolic of the start of the Tour de France. Here, there isn’t much between the riders in the overall rankings and everyone has a chance of winning. The trophy narrows in the middle, because a number of favourites emerge during the Tour. The top part of the sculpture symbolises the four winners, who triumph at the finish in Paris. What gave you the inspiration for this year’s winners’ trophies? The idea came to me in the ŠKODA Museum in Mladá Boleslav when I was standing in front of one of Laurin & Klement’s first bicycles from 1899. I admired its many exquisite features – very inspirational! The sculptures awarded to this year’s Tour winners were therefore designed according to the motto ‘getting back to your roots’. The curved lines, which are incorporated into the crystal glass, symbolise spinning wheels. 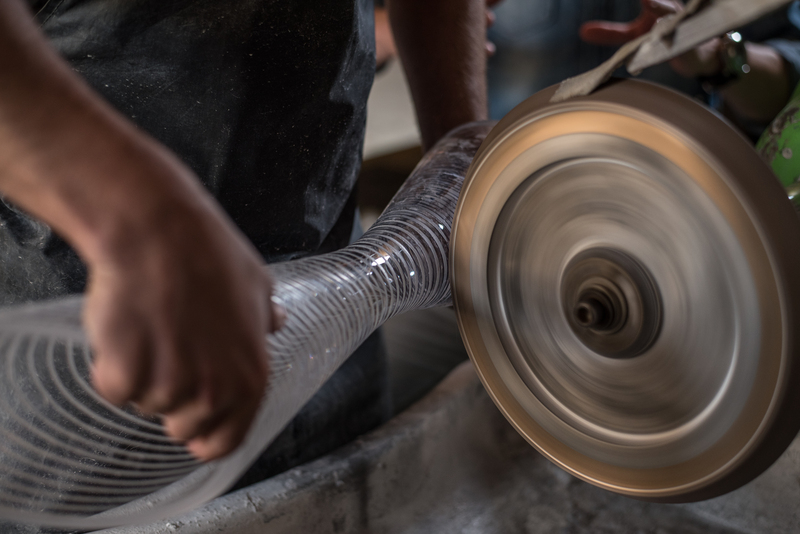 An eye for detail: Peter Olah has learned the fine art of glassmaking – the knowledge gained from this is incredibly important for the design process. The manufacturing of one of these crystal glass sculptures takes three to four days. They are manufactured by the prestigious Czech glassmaking company Lasvit in Nový Bor and require great craftsmanship. Around nine people are involved in total – from the designer to glass experts to glass-blowers. After what is known as the melting stage, the glass is processed at 900-1300 degrees Celsius. I find the glass-blowing stage that comes next particularly exciting: I learnt how to do it myself because glass and its production have fascinated me for a long time. After moving to Prague, I really wanted to see how the Czech Republic’s world-famous crystal glass is produced. I created designs which I hoped could be produced by a glass manufacturer but when I showed the guys my ideas, they just laughed. They then explained to me that glass is completely different to other materials. It has specific properties that must be taken into account during production and even at the design stage. The unworked molten glass is hand-blown into the wooden moulds. At this point they still weigh around ten kilograms. 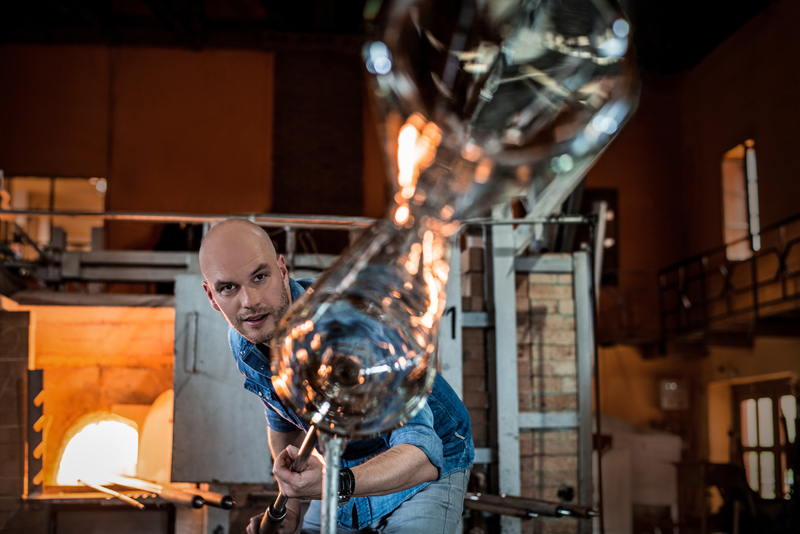 The glass-blower shapes them to the desired shape using the 1.5-metre-long glass-blowing pipe – this work demands a lot of strength, great delicacy and plenty of experience. The glass is then hand-cut and embellished. Last year, for example, we used small, sparkling crystals to do this, which enhanced its lustrous appearance. Each of the finished glass sculptures is 60 centimetres tall, weighs four kilograms and features the same design. This is because the winners of each of the Tour de France’s four categories all deserve equal admiration. The only exception is the trophy for the best sprinter, which is made of green glass. The reason for this is as follows: ŠKODA AUTO is the sponsor of the green jersey at this year’s Tour de France, as was the case in 2015. Have you met any of the cycling stars in person? Yes, I had the pleasure of meeting Peter Sagan. He’s from Slovakia, like me, and is very popular in my home country as reigning world champion and five-time winner of the green jersey. Since then I have become a real fan of his. 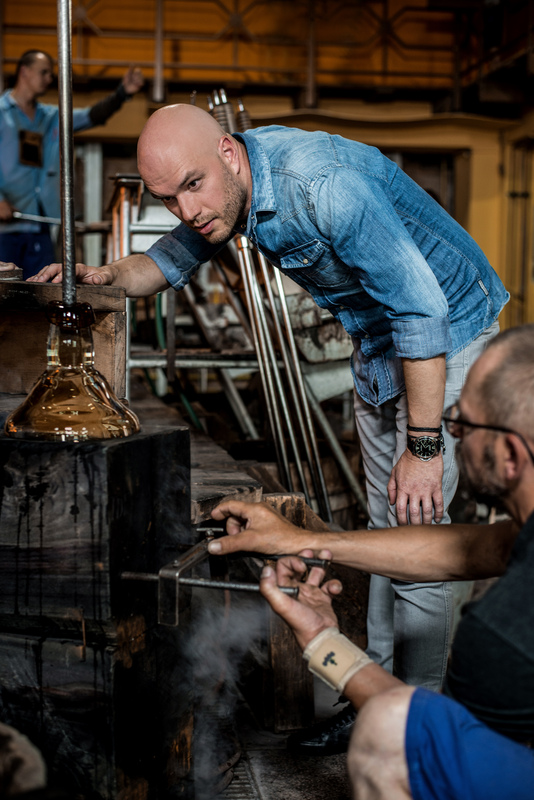 Great craftsmanship: The molten glass is poured into a wooden mould. This is because the winners of each of the Tour de France’s four categories all deserve equal admiration. The finishing touch: Elaborate cutting creates the ornate embellishment – this stage of the process also requires a delicate touch and plenty of experience. The Czech glassmakers have mastered this skill to perfection.